Enlisted soldiers’ blogs provide an organic support network for military communities, coveted news from the battlefield, unfiltered assessments of the bleak prospects in Iraq and, sometimes, amplification of the Pentagon’s official message. Watson emphasized, for example, that Reece was “trying to bring peace and freedom to a nation that has not seen such a thing,” while his killers were part of “a faceless, cowardly enemy who will do anything to prevent such a bright future for their country.” The language could have been drafted in Arlington. Yet the crackdown on soldiers’ web activities is coming from the Pentagon. The Defense Department has drastically restricted blogging and prevented many enlisted soldiers from visiting social networking sites. Last year, a policy banned thirteen popular websites, including YouTube, MySpace and BlackPlanet, from military computers. The restrictions would pre-empt bloggers like Watson, who started writing through a personal profile on MySpace. And this year the Air Force banned access to a military social networking site, TogetherWeServed.com. Pentagon officials say these measures are designed not only to save bandwidth but to save lives. By enabling soldiers to share “information with friends and family members,” an Army memo states, social networking poses a “significant operational security challenge.” Operations Security (OPSEC) is the military’s program to prevent soldiers from disclosing benign actions that might still provide useful intelligence to adversaries. The idea is that innocent bits of information, such as how many twilight pizzas are delivered to the Pentagon, could reveal classified material, like the imminence of a new operation. MySpace is jammed with innocuous as well as damning information, and blogs detail many young people’s lives in real time, presenting a minefield for OPSEC restrictions. Many soldiers write about their experiences online, within social networks and on independent blogs, which now top 2,000, according to an estimate by the military blogosphere site Milblogging.com. The Defense Department is experimenting with aggressive rules to rein them all in. Maj. Ray Ceralde, who directs OPSEC, helped write regulations requiring soldiers to clear in advance potentially every blog post or personal e-mail with a supervisor. 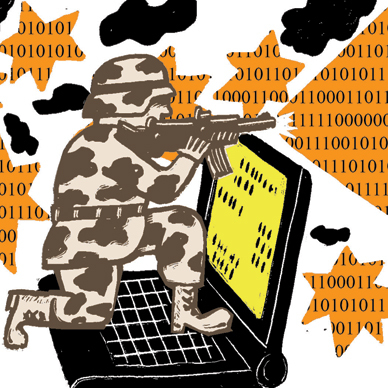 “The Internet, personal Web sites, blogs–those are examples of where our adversaries are looking for open-source information about us,” he told the Army News Service. One Air Force briefing estimated that Al Qaeda members have created hundreds of false accounts on social networking sites, according to an April article on an official military site. Yet while the regulations are strict, enforcement is not. “I never had any of my posts reviewed before I put them online,” Watson said, noting that the Army probably “doesn’t have the capacity” to review thousands of entries every day. After discovering the blog, Watson’s platoon leader demanded to vet each post. Watson chose to stop writing instead. But soon he was able to restart the blog, he explained, with support from others in the “chain of command.” For general policy, the Army Public Affairs office released a memo clarifying that approval is not required for every blog post, as long as the “Soldier blogger” follows OPSEC training. The pressure on soldiers can still flow in other ways. One anonymous sailor told Stars and Stripes that after discussing controversial Navy topics on his blog, his superiors said it would “adversely” affect his career. Phillip Carter, an Army reservist who writes the popular blog Intel Dump and finished a tour of Iraq in 2006, thinks that blogging security regulations are valid, but “certain overzealous Army officials would take those legitimate justifications and use them to support overregulation of soldier communication and blogs.” Multimedia restrictions will recede over time, Carter predicts, because the next generation of officers is “less risk averse” toward communication technology. Other observers also sense a slow shift toward a more open military culture. Steve Field, a former Army spokesman who writes for the blog D-Ring, named after an outer corridor of the Pentagon, thinks that the ban on interactive sites revealed a military choice “to exert control over a space that is moving more and more toward sharing and free expression.” And total control of the web is untenable, as some officials are already realizing. The Air Force recently reversed its ban of the networking site TogetherWeServed.com, announcing that the site did not pose any special security risks. Some military brass even advocate active engagement online. It’s not surprising that the Defense Department has reacted negatively to soldier blogging. The military is a strenuously hierarchical institution, with finely graded ranks and carefully managed authority. Social networks create new openings for soldiers to step outside that hierarchy, even while deployed, and share their perspective to large and strategically important audiences. That gives military planners pause. Yet isn’t it axiomatic that soldiers are entitled to exercise the freedoms they are willing to die for? It was that principle, coupled with antiwar activism, that drove America’s last successful popular effort to amend the Constitution, to grant suffrage at the age of enlistment. Today’s soldiers have much more modest requests. They want to network with new people, commune with friends and family, and share their stories with anyone out there who wants to listen. Pentagon leaders should be first in line.